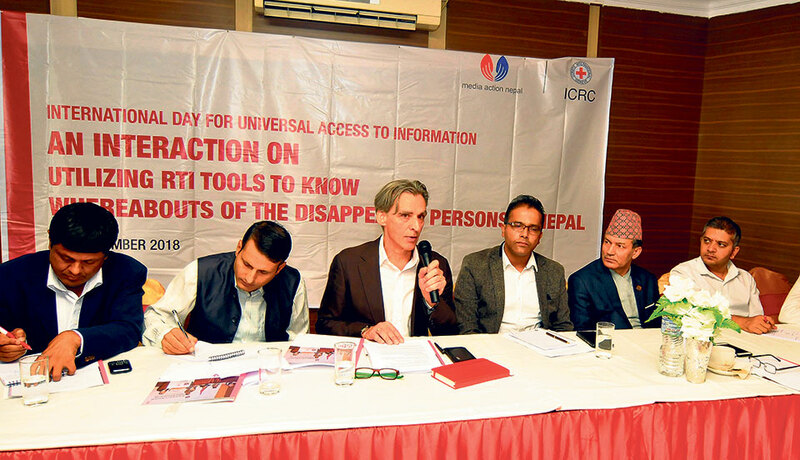 KATHMANDU, Sept 29: Experts, concerned governmental authorities, family members of the people who went missing in the conflict era and journalists held an interaction on Friday on the Right to Information (RTI) tools to learn about the whereabouts of the disappeared persons in Nepal. The interaction was organized by the Media Action Nepal (MAN) and the International Committee of the Red Cross (ICRC) as a celebration of the International day for Universal Access to Information. Addressing the interaction, ICRC Chief of Mission to Nepal, Andre Paquet called the function a good opportunity to highlight the needs and pleas of the family of the missing persons. “Losing someone is very painful. Huge tragedy has been inflicted to the family of the missing persons in Nepal,” he said. Also, various journalists accused the Truth and Reconciliation Commission (TRC) and CIEDP of not being able to find out the truths about the missing persons. They also complained to the chief guest of the interaction, Chief Commissioner of the National Information Commission Krishna Hari Baskota about the undermining of their right to information by various governmental institutions. Similarly, Editor in Chief of Republica Daily Subhash Ghimire questioned the media friendliness and transparency of the two commissions responsible for investigating into the cases of the victims of the conflict era. “The commissions should focus on making the local stakeholders feel a sense of ownership for the commission,” he said. Ghimire also emphasized the need for the media to set a proper tone on the issue and write more comprehensive stories on the issue to pressure the commissions to work effectively. At the interaction, various experts, representatives of various authorities and family members of disappeared persons discussed various issues associated with the disappeared persons in Nepal.